Arizona’s seasonally adjusted unemployment rate increased to 4.8 percent in December, up from the November rate of 4.7 percent, according to the latest report published by the Arizona Office of Economic Opportunity. The national rate increased to 3.9 percent. In December 2017, the state had a seasonally adjusted rate of 4.7 percent, and the national was at 4.1. The state had a net loss of 5,900 non-farm jobs over the month, which is different from the post-Recession (2010-2017) average gain of 5,600 jobs. Education and Health Services had the largest increase with 800. Construction gained 700. Of the 11 sectors tracked, Government recorded the largest net loss of 4,000 jobs. 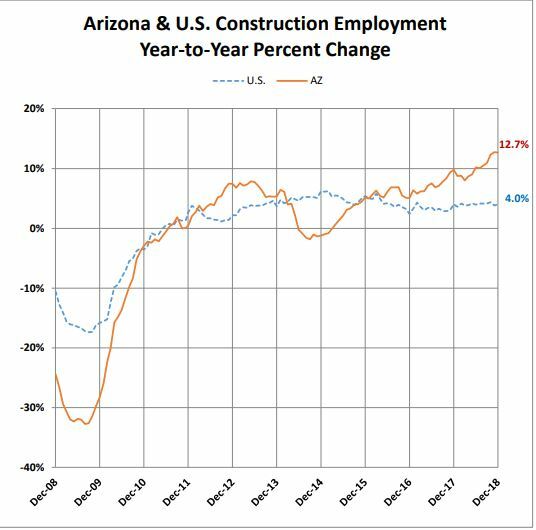 Construction in Arizona takes the top slot in job gains from Dec., 2017 to Dec., 2018 with a total of 19,200, while Professional & Business Services came in second with 18,100. The Construction sector features three major segments: Buildings, Heavy, and Specialty Trades. There are currently 36,100 jobs in Buildings, which remains unchanged from November and is up 6,300 from December of 2017. Heavy Construction gained 200 over the month for a total of 18,200, and is up 800 from Dec., 2017. Specialty Trades increased 500 for the month at 116,000, and the segment added 12,100 over the year. Construction jobs in the Phoenix Metro Area (Phoenix-Mesa-Scottsdale) increased 1,000 over the month, for a total of 134,600. The Dec., 2017 number was 118,400. The Metro Tucson construction job numbers remained at 17,400 from November and increased by 1,000 from Dec., 2017. Yuma, Flagstaff, Prescott, Lake Havasu City-Kingman and Sierra Vista-Douglas combine Construction and Natural Resources jobs in reporting their job sector totals. Yuma and Prescott remained unchanged at 2,500 and 5,900 respectively for the month, while Flagstaff lost 100, for a total of 2,600. Lake Havasu City-Kingman and Sierra Vista also remained unchanged at 3,200 and 1,500 respectively.